Plenty of chances to get in the mad & merry spirit this month! Next up is a nice string of holiday music making gigs. 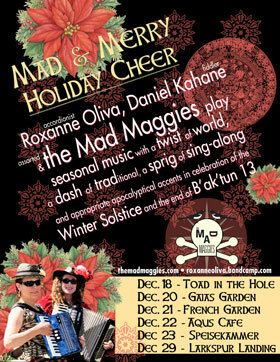 Once again we are joining forces with fellow accordion babe Roxanne Oliva & fiddler Daniel Kahane to present seasonal music with a twist of world, a dash of traditional, a sprig of sing-along and appropriate apocalyptical accents in celebration of the Winter Solstice and the end of B’ak’tun 13. For these shows we perform semi-acoustically and our line-up varies somewhat from gig to gig. The shows are fun, relaxed and perfect for families and kids. Bring your singing voice. December 20 – 7pm – Gaia’s Garden, Santa Rosa. No cover. All ages. Voted best vegan restaurant two years in a row! December 21 – 7pm – French Garden Bistro, Sebastopol. No cover. All ages. Listed in the 2012 Michelin Guide as a “Recommended Restaurant:. a 20 minute set right at 5:30pm. December 22 – 7pm – Aqus Cafe, Petaluma. No cover. All ages. Join us by the waterfront. December 23 – 3pm – Speisekammer, Alameda. No cover. All ages. Best German style food in the Bay Area! December 29 – 11:00am to 12:30pm – Larkspur Farmer’s Market, Larkspur Landing. No cover. All ages. Look forward to seeing you at one of our shows.